"I was browsing on Builders Crack and found Go 1 Day Painting. I booked a quote as their reviews were good. The guy at the office (I forgot his name!) was very nice and helpful. I kind of had an idea of what paints and color combinations I wanted, but I went with his suggestions since he's the pro. The crew came on time and worked speedily. Couldn't be happier with the results! " "Sam has a professional demeanour as well as his staff. When it comes to painting, the prep work is what's important & they did it well. Thanks your help." "Mike was really awesome! We had him paint a couple rooms in our newish house. Walls were really scuffed up before, and now they look like new again, all at a very reasonable price. The house was kept neat and clean during work which we really appreciated as we have kids." "Go 1 Day Painting painted my rental property in west Auckland, we were on a tight time line as there were other renovations going on. They competed the project on time & were good to deal with." "I hired Go 1 Day Painting to paint the exterior of my house they did a great job on the prep, pricing & finish. I defiantly will be recommending them to friends and family." "I contacted Go 1 Day Painting to have my bedroom painted, big fan of how I can just book the quote directly on the website. Mike came by to take a look at the bedroom (and the mess I made trying to paint it myself). He came out 2 days later and transformed it into a beautifully finished room. Thanks again for your help!" "I chose to go with Go 1 Day Painting because of their reviews, they were easy to deal with, had very competative prices and were on time." "I found Go 1 Day Painters on no more cowboys & was interested in them after seeing so many great reviews, so I contacted them for a quote to paint my 2-story home, that really didn't need a paint job, but I wanted to change the colour. First of all, I was impressed by Sam who came out to quote the job. He offered ways for me to save money & was up-front about most of the fascia that was in good shape & really did not need to be painted. Since I am not rolling in money, I… appreciated his honesty and trusted that he was not trying to pump up my quote. I will be using Go 1 Day Painters for my future painting needs and will recommend them to my friends & family." "Thanks for the great work team as a builder I know a good crew when I see one. Quality work at a fair price. " "I hired Go 1Day painting to paint the exterior of my house they did a really good job on the prep, pricing was fair and done on time. I will definitely recommend them to anyone looking for a painting company to hire." "Yes I'm giving a 100% rating which I hardly ever do. Firstly a quote was very easy to book directly on their website so I was very happy to avoid the usual game of phone tag that happens when organising contractors. The quoting person arrived on time and was very professional and took the time to discuss a few options with me. They arrived for the paint job when they said they would and left my home spotless. Thanks again for a great job." "Great job & easy to work with"
"Very easy to work with, pleasant staff and left my house spotless"
"Great job. Came through on short notice and delivered on their promise of a great finish in a great time-frame. " "We're so happy with Go 1 Day Painting's work, that we are hiring them again for the 3rd time. They do excellent work and always stick to the schedule. They also have very competitive pricing." "Very well run company. Thanks for the great work." "I had a small job which most companies didn't even get back to me about. 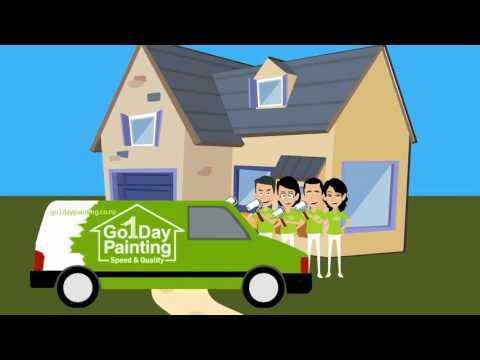 Go 1 Day Painting took the job for their minimum payment and completed the job quickly and on time. The repaint went perfectly just took one day I'm happy to say I am enjoying my new place, admiring how good it looks! "Steve & his team painted a couple rooms of my house. I'm absolutely wrapped with the quality of the job. Dion (the painter who looked after my job) was wonderful to work with. If you're looking for a painting company look no further. Great service at a very reasonable price. " "Great work & great price "
"We painted the majority of the interior of our apartment. The work was completed on-time and with efficiency. The Two painters completed the job and both were very skilled and knowledgeable. "I contacted Go 1 Day Painting to paint a baby room while my wife was at work, to be honest I had my doubts on whether the job could be done in just 8 hours however Go 1 Day Painting didn't fail to deliver. I'm very happy with the result and my wife is very happy with me! :) "
"Go 1 Day Painting looked after the exterior painting of my home. To be honest the condition was pretty bad has we always planned to knock down and rebuild. However our circumstances changed (had a baby) and we decided to paint the exterior. Go 1 Day Painting did a great job, their painters were a pleasure to deal with and they completed the project at an excellent price." "Great job. Very happy with the results and the price. Thanks again!" "Go 1 Day Painting was excellent to work with. From the start, booking a quote was super easy (I could do it directly on their website). The owner of the business showed up on time to the quote, looked professional and discussed some options that helped me save about $500 on my paint job :D The actual paint job was excellent, there were a couple small touch ups which were fixed the same day I notified them." "Very happy with the work Go 1 Day Painting did & they did it at a better price and in half the time other companies quoted!" "I'm a builder that looks after mostly high end renovations. I've been using Go 1 Day Painting for about 2 years now and can confidently say they are very good to work with, deliver on their word and a high quality product for a good price. " "Great work. These guys were a pleasure to work with and did a great job." We realise getting your house painted is about as fun as watching paint dry - that's why we've created a system that minimises the disruption caused to you, your business or family by getting your space painted quickly - allowing you to get back to your regular life. Go 1 Day Painting was started by Go Projects in 2015 - and since then our eco-friendly business has been revolutionising the painting industry. We've completed painting projects in just 1 day - that would take other painting companies days or weeks to finish. We believe the best form of marketing is delivering a quality job and exceptional customer service - in a timeline that no one can beat. After we complete each project your Project Consultant will take you for a walk through to wrap up. Shortly after we've cleaned up, you'll receive a call to ensure that the work, colours and experience have met your expectations. We use the feedback we get as part of our regular meetings to continually improve what we do. Using large crews does have its advantages beyond getting a job done faster. It allows the Team Leader of each crew to stay put and manage your project from start to finish instead of bouncing around several job sites to manage several smaller teams of painters at once. Our Team Leaders have a minimum of 10 years of experience painting as well as excellent leadership abilities. Go 1 Day Painting is a complete painting services company. What this means is in addition to painters, we have builders, roofers and plasterers on hand. These supporting trades allow us to look after your job from start to finish which means a smoother experience for you, better communication between different trades and on time competition.